While attempting Recovery System from xp cd. – System hanging when attempting to reinstall windows xp. – Windows loaded as far as logo and then restarts. Replaced RAM with a working RAM of similar specs. Ok.
-Voltage trace from AC supply through fuse and across current sensor resistor. Discovered zero voltage after resistor. -Ohms check on resistor. Opened. Continuity check. Open. – All other major components like large filter caps, FET and transformer primary windings checked ok.
Sensor Resistor 0.5Ω opened during high power surge caused by power black outs. Directly replaced resistor. I replaced with a 1Ω resistor. Switched on and the printer came back to life. -Arc welding was in progress outside when monitor became faulty. -User noticed a change in colour to yellowish display and then blank (no display). -Switched on. High voltage present. Heard and felt static on monitor glass. -. Green power led blinking. -Opened cover to check for burnt components. Nil. -Removed G2 line from CRT board and checked voltage. 299VDC. Power surge caused blue resin coated High Voltage ceramic capacitor (103, 2KV) to short out. -Voltage check on CRT board and G2 circuit. -Powered on monitor and connected to Desktop. Windows xp logo displayed. Problem Solved. Note: Thanks to Jestine Yong www.jestineyong.com I was able to fix this monitor. Materials: Conduit, Coax cables, Insulation tapes and cable ties. Located satellite 270◦ West. With compass and GPS. Checked site and location where dish would be mounted. Access by forklift up to roof of weighing bay, then climb standing ladder to Cold Storage Roof top. Coax cable to be dropped 90◦ downwards and through a drilled hole 25mm. -Used 2.5M x 65mm galvanized pipe to hold dish and mounted into stand. – Configured RCST IP, calculating default IP. -Installed VSAT antenna on top of RDEX Cold Storage building facing 270◦ West. Located satellite and locked in with spectrum analyzer. Confirmed IP address and Gateway with Telekom VSAT HUB. -Confirmed with Telecom Technicians that 10Mbps was good speed using speed test for download and upload. Removed 1.2m Satellite Dish from Roof top that was loosing signal due to shaky movement during strong windy periods also when birds perch on dish and feed horn arrangement. Unsteady bracing and need larger dish. Installed 1.8m Dish Ground post mounted. Locked onto Satalite NSS-6 at 270° W Signal Strength at 17 bars. On Spectrum analyzer. It was hot and sunny and the saftey specs had been crushed under the forklift that was elevating me onto the roof. Removing the 1.2m dish from the roof top was a breeze. However, it took a little longer and two forlifts to maneuver the 1.8m antenna on the pole bracket. After the feed horn, LNB arrangement was attached, Russel took out his “Specam” (Nick name for Spectrum Analyser). The TX and RX were connected to the Linkstar RCST (Return Channel Satalite Terminal) unit or IDU (In Door Unit) as some would put it and then all of sudden time froze as we tried to lock onto the satalite. Eyes glancing at the specam, the sound of metal clattering as the shifter on the nut turned to adjust the azimuth. Tilting it, swirling it right and left as the dish boomed out its microwave at 17 bars on the Specam. Satalite locked. Let’s go inside. Configurations were already set during the first roof installtion so that didn’t take long either. Just a phone call to the Telikom Hub and confirmed that the IP address and gateway was sited. Conducted a speed test at www.speedtest.net Thanks to Telekom PNG’s new ViaSat system, I can listen to live internet radio and download and upload at a faster speed. 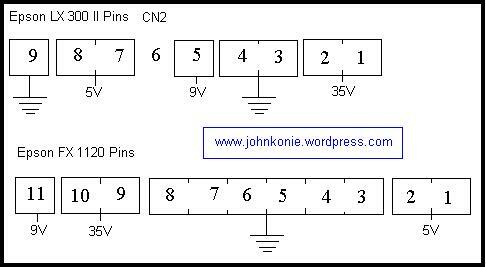 – Switch Mode Power Supply (SMPS) problem. -Changed fuse still no power. Changed 5W 10Ω J 64 resistor. Shorted out on pwer up. Checked primary resistors.OK. Checked filter capacitors. OK. Checked FET K2718. Faulty. Power Burn out caused by voltage fluctuation. Parts is a problem. Need to modify another similar SMPS board to fit. Salvaged power board from old Epson FX 1120. Modified to fit into ATX PSU casing and connected to the main board. Now to test it out. Powered up.ok. LEDs on ok. Operating buttons working. Test print ok.
Posted on February 11, 2009 May 15, 2016 Categories UncategorizedTags Computers & Electronics1 Comment on Hello world!